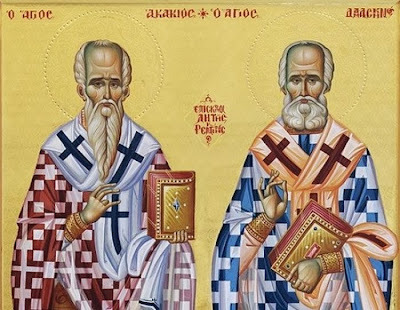 On November 27, 2013 the Sacred Metropolis of Lagada, Liti and Rendini organized the canonization of Saints Akakios and Damaskinos the Studite, who were both Bishops of Liti and Rendini in the 15th and 16th centuries. The feast of Saint Akakios will henceforth be celebrated on August 16th and Saint Damaskinos the Studite will be celebrated on November 27th. Metropolitan John of Lagada, Liti and Rendini submitted the names of these newly-glorified Saints to be included in the Synaxarion of the Orthodox Church, and with the approval of the Ecumenical Patriarchate this took place in the Sacred Church of Saint Athanasios in Liti. The Ecumenical Patriarchate and the Church of Greece were represented by Metropolitan Anthimos of Thessaloniki during the Hierarchical Divine Liturgy, who was among many hierarchs, priests, monks, government officials and faithful celebrating the first feast of Saint Damaskinos the Studite. Many photos can be seen here of the event.